Today's Name of the Day is the Latin boy's name Augustus. For years, this name was considered somewhat fusty, or even pretentious. Today, parents are seeing it differently. 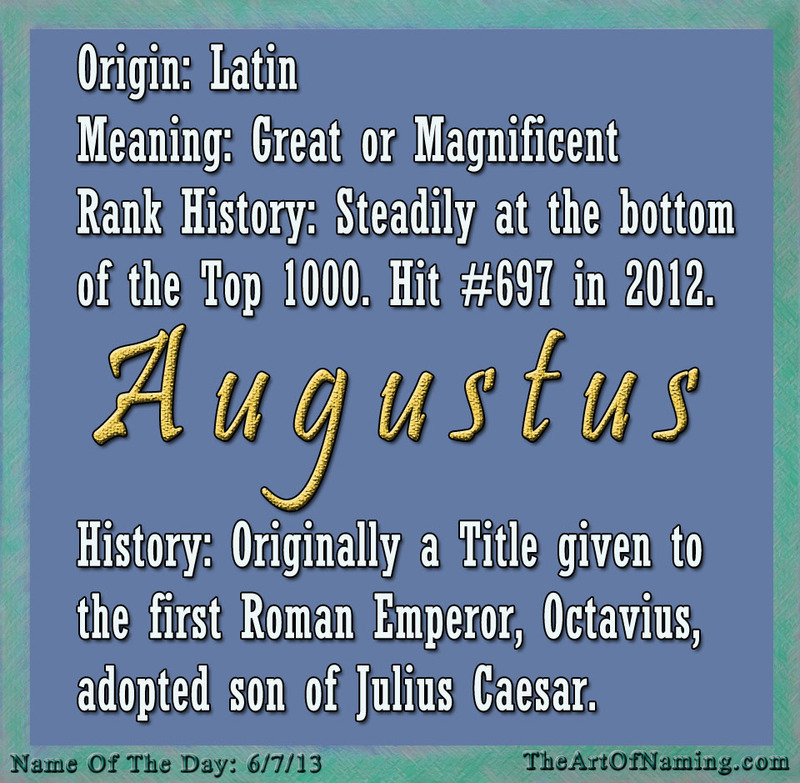 Like my own son's name, Maximus, Augustus was originally a title meaning "Great," "Magnificent" or "Venerable." It was given to the first Roman Emperor, Octavius, who was the adopted son of Julius Caesar. He kept Augustus as his name. The month of August was also named in honor of him. 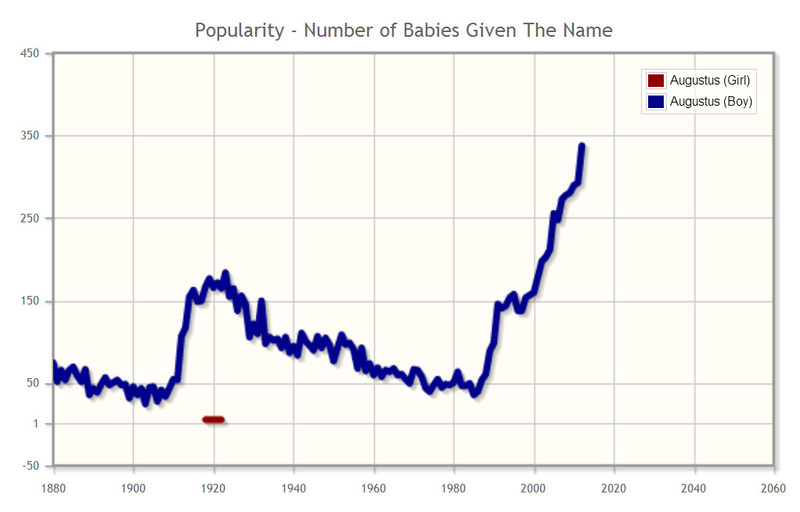 The number of babies given this name has gone down, up, down and way back up again over the years, starting in 1880 until now. As far as chart ranking goes, it hit as high as #175 in 1880 (a total of 74 babies). 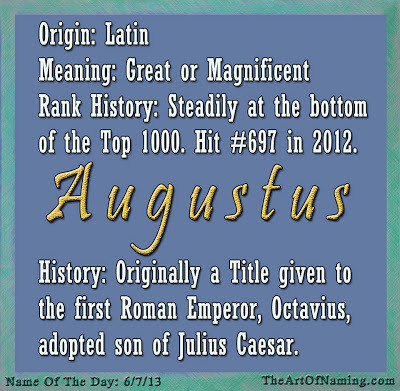 In 2012, it ranked at #697 with a total of 337 little boys named Augustus. It remained steadily in the Top 1000 from 1880-1968 when it fell off the chart. It jumped back on in 1991 at #874. I think this name is very handsome and I would recommend it to parents who want something masculine and strong for their little guy. In fact, most of these Latin "-us" type names are starting to catch on a bit with modern parents. Would you ever consider this name? 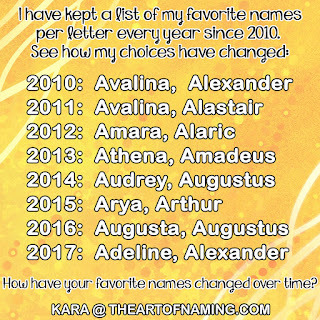 First name or middle name spot? Let me know your thoughts below!